Because of his Shifu's guidance and the gentle reminders of other Tai Ji Men members, Luojia Zhang has learned to self-reflect and improve himself. He touched the hearts of his mother and many other audience members when he said, "Mom, thank you for your love and support all these years. I love you!" Beautiful music was heard coming from the Lecture Hall of the Sun Yat-Sen Memorial Hall. 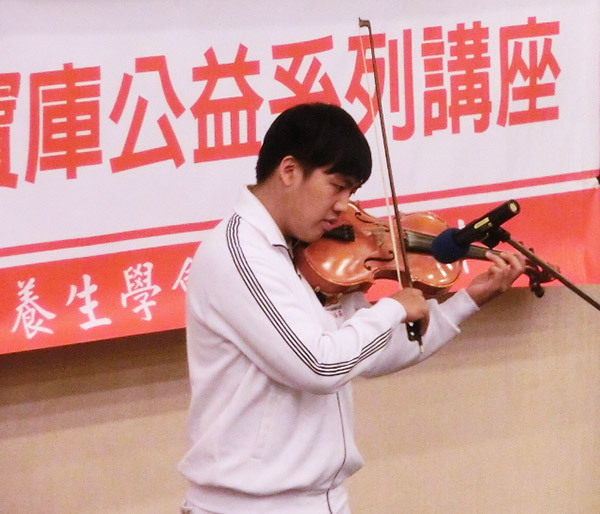 The music was performed by a viola player Luojia Zhang, who was presenting a song titled "The Moonlight in a City" to show his gratitude to his parents during an event in celebration of Mother's Day. Luojia currently is a freshman at Hsuan Chuang University, and music has brought him a lot of joy and challenges. The notion that "a child who plays a musical instrument won't go astray" has been widely promoted in TV commercials in Taiwan. But, is that true? Luojia grew up in a family of musicians. Both of his parents are musicians who obtained a music degree in France. Luojia is the elder son in his family, and he was expected to follow in his parents' footsteps. Luojia began to learn the piano since preschool. He liked music very much. Every day the most important thing for him was to practice the piano. He would practice for at least two hours a day. He put more efforts in music than in academics. He diligently practiced the piano in order to make himself a better player. He worked very hard for a long period of time, attempting to pass an important music exam before he went on to the third grade. If he passed it, he would be placed in a special music class. However, he failed the exam. This setback caused him to dislike music and doubt himself; negative thoughts would easily pop into his head, and he lost interest in many things that he once enjoyed. Recalling that period of time, he said that he was addicted to comic books and video games and had no goals for his future. Even till the third year in middle school, he still had no idea about what he planned to do. Luojia chose a design major in high school because he thought the animation of "Avatar" was very cool and fancy. After studying the animation technology, he realized that it wasn't what he wanted. He lost his goals again. Luojia made friends with people who like fooling around. He started to smoke cigarettes and get into fights, and he would arrive home very late and pay no attention to his parents' advice. He would often feel annoyed by his parents and would even quarrel with them. Luojia also thought about dropping out of school. His teacher would call her mother almost every day, and his mother was at her wit's end with how to guide him. Luojia has been a member of the Tai Ji Men Qigong Academy since little. One time, when he was chatting with other members at the academy, one of the members reminded him that their Shifu (master) often said, "You reap what you sow." Luojia suddenly woke up and said to himself, "That's right! I didn't work hard enough. I wouldn't accomplish anything simply by complaining. If I want something, I need to work for it." Luojia contemplated for a long period of time and then planned to pursue a music career by taking a music exam to get admitted to a high school music class. Luojia said, "I always feel that music is in my DNA." However, his parents disagreed with him. The reason is that the economy isn't good, so less children are taking music lessons. They were afraid that even when Luojia earns his music degree, it's very likely for him to become unemployed. Therefore, his parents hoped that he would finish high school first. During his third year in high school, Luojia attended a symposium on prospective college majors and learned about the courses required for a journalism major. Disgusted by some irresponsible media in Taiwan, he wanted to become an honest journalist in the future. After discussing with his parents, he decided to major in radio and television at Hsuan Chuang University. Luojia remembers vividly what his parents said to him when he was about to start college in another city and learn to be independent: "Now you are going to live on your own. You need to work harder. If you encounter setbacks or failures, it's okay. Just get up and keep trying. Never forget that we will always be there for you." These words really touched him. When he went back to his room, he couldn't help bursting out crying. He wished that he could do better so that his parents wouldn't worry about him. Luojia is a college freshman now. No matter how late he stayed up the previous night doing homework or editing films, he'd go to his class on time every morning. He would sit in the front and listen attentively. Luojia keeps his Shifu's teaching and his parents' loving words in mind and does his best in everything he undertakes. He is working hard to create a brighter future. This year during Mother's Day, the Tai Ji Men Energy Family held a symposium titled "Love Abounds in May" in the Sun Yat-Sen Memorial Hall. Luojia shared his story and played the viola in front of the audience. Through his music, he wished all the mothers in the world a joyful Mother's Day. When his performance ended, the audience gave him warm applause. A lady in the audience especially gave him a standing ovation. She is the mother of Luojia. It was evident that she was very proud of her son's efforts as well as his personal growth over the years. Luojia approached his mother and said to her gently, "Mom, thank you for your love and support all these years. I love you!" The interaction between the mother and her son moved the other audience members to tears, and they gave them a big round of applause. Luojia is lucky to have patient and tolerant parents. His journey of growth and transformation is like a piece of dramatic music. This family's story helps shed some light on the subject of parent-child relationship.